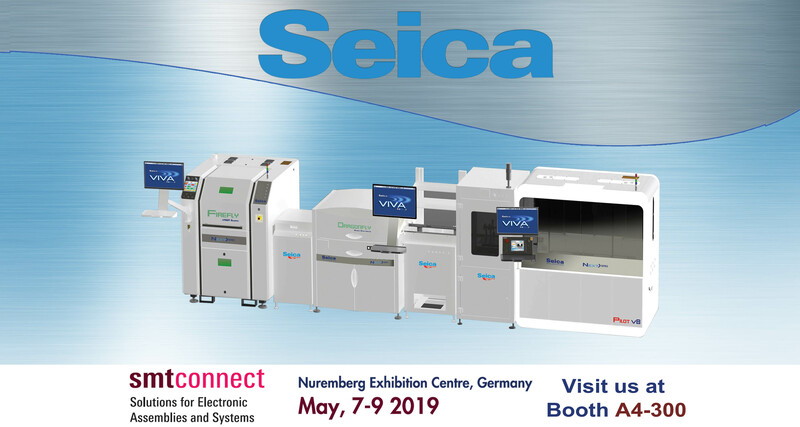 Visitors to SMTconnect 2019 looking for new and innovative solutions will have the opportunity to see that “solutions” are the central theme in SEICA’s booth A4-300. The first solution on show will be an automated board assembly line with selective soldering, visual inspection and electrical test, fully equipped with conveyors and handlers by Seica Automation. The Firefly Next > series, the first station in the line, represents the leading edge solution for selective soldering. Its perfect integration, on a single axis, of a high-efficiency LASER source, fully-programmable donut spot, vision system and temperature sensor, effectively redefining the levels of performance of this technology in terms of flexibility, throughput, reliability, applicability and process traceability. After soldering, the DRAGONFLY Next > series provides optical inspection of THT components: the combination of multi-colored LED lighting and color scan camera enables detailed inspection of the solder joint meniscus and shorts detection, while the full scan acquisition of the PCB surface and not only of the components allows the detection of solder balls. The DRAGONFLY Next > series also includes the configuration for conformal coating inspection of finished products, as well as for process control and setup. Configurable for single and double sided inspection of the board, its intuitive and streamlined management software environment enables the user to develop and deploy an application program in a few hours. The last step in the line is electrical test, performed by the Pilot V8 Next, the most extensive flying probe test platform on the market, with up to 20 mobile resources for testing an electronic board. The standard test probes can each apply up to 2A current, and the system can be configured with high-resolution cameras for automatic optical inspection, barcode and data matrix reading, laser sensors, capacitive probes, pyrometers, optical fiber sensors for LEDs, mini-fixtures for boundary scan and On Board Programming. Shown in its fully-automated version, compatible with any standard assembly line, the Pilot V8 Next is engineered for medium/high volume production, and can be configured to satisfy the full range of different board test requirements: the HR option extends the performance to include probing of extremely miniaturized devices (down to 30 µm), the HF option includes high-frequency probes able to measure signals at frequencies over 1.5 GHz (an absolutely unique performance on the market), while the XL version expands the standard work area of 610 x 540 mm to 800 x 650 mm, to accommodate and test “extra-large” boards. 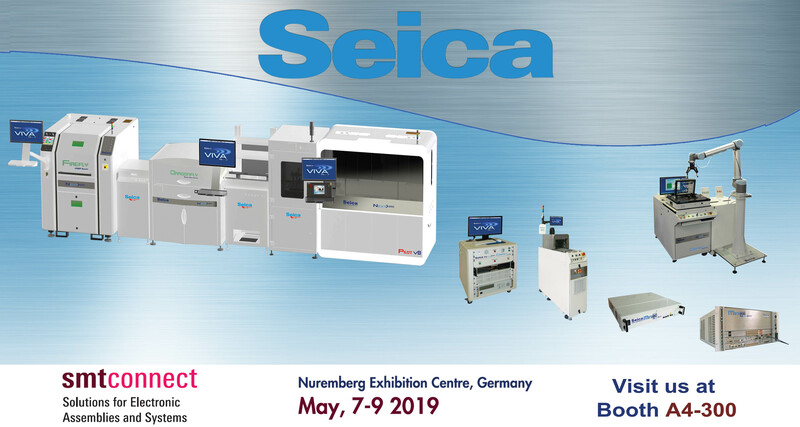 The next solution that Seica will be presenting at SMT is aimed specifically for the test requirements of manufacturers of flex circuits: the Rapid H4 Next > series flying probe tester with integrated, fully automated, reel-to-reel handling and vacuum system. Seica’s Rapid line is the new generation of flying probe solutions able to meet the challenge of testing the most advanced embedded-component PCB technologies, as well as ceramics and substrates. Seica’s innovative, single-platform approach and over twenty years of experience in flying probe testing of printed circuits and assembled boards, make the Rapid Next > series the most powerful and versatile solution on the market. The Rapid H4 for testing flex circuits will be deployed in Seica’s Virtual Factory area of the booth, and visitors will be able to have a hands-experience with this solution and others in a realistic manufacturing environment. In the third area of the booth Seica will propose some innovative solutions designed for today’s manufacturing realities and challenges. The use of collaborative robots (COBOTs) is gaining ground in an industry that needs to automate even in constricted spaces, and Seica’s highly configurable Compact Next > series line is able to propose diverse solutions, easy to combine with this type of automation. The Compact Digital Next> tester, which includes a wide range of resources for analog measurements and powerful digital channels that extend its test capabilities from MDA/ICT all the way up to the functional test of complex digital boards, will be showcased combined and fully-integrated with a Cobot and vacuum-type receiver. Other solutions designed to optimize the performance/footprint ratio on display at SMT include the Compact Cube Next>, a portable solution that fits under a standard worktable and is ideal for the customization required for specific functional test applications, and the MINI LINE, which offers a high level of configurability and performance for multiple applications in a 19” rack-compatible format with an optimum entry-level price. All of the solutions are equipped with Seica’s VIVA Next> 64-bit software which provides a complete set of utilities and tools specifically designed to easily manage all aspects of test as well as a Test Studio, that allows the user to develop functional testsequences using whatever software is most familiar or preferred (eg. VIVA VL, VIVA Quicktest, VIVA Flylab, TestStand, Labview, MS Excel, Python). VIVA NEXT provides intelligent integration with all aspects of the customer’s manufacturing processes – data collection, traceability, interaction with MES, repair operations – and all of the Next> series systems have Canavisia’s Industrial Monitoring solution on board, with the potential for remote monitoring of current and voltage consumption, mains supply, temperature, light indicators and other parameters useful to indicate correct operation, provide information for predictive maintenance and, in general, to render the systems compatible with today’s Industry 4.0 standards.